Both new and some experienced shooters experience the challenges of controlling the trigger for good hits and must continually practice the fundamentals. I believe that trigger control is one of the, if not THE, most important of the eight fundamentals for effective shooting. While the focus is on the very important trigger control, we must recognize that all the fundamentals are interwoven and influence trigger manipulation and accuracy on target. There are many types of trigger control mistakes and some use different terms to define the same mistake, but the emphasis should be on overcoming them rather than on the terminology. 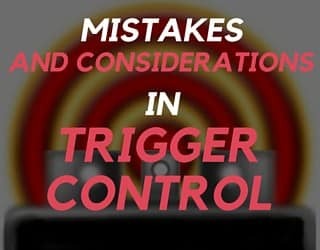 So here are seven of the many trigger control mistakes I have identified and want to share my definitions and considerations with you, so you can avoid some of my and my students’ mistakes. Hope it helps or at least serves as a starting point for you. Here are my definitions and thoughts about each of these problems. Jerking the trigger at the last second is a mental and physical issue, but primarily a mental one. Shooters must understand the necessity for mentally focusing on their trigger press and train the jerk or slapping motion out of their mechanics. If shooters are consistently shooting to the lower left (as a right-handed shooter), they are probably quickly yanking the trigger back and, perhaps, not even realizing it. A jerk comes from the attempt to fire the shot quickly at a specific point in time that coincides with when the gun becomes immediately positioned on the target. I learned for myself that my eye was usually focused on the target and not on the front sight. Some call this “Timing” the shot. At that instantaneous point in time when the shooter sees the sights on the target, they quickly and suddenly yank on the trigger with the trigger finger so as to hurriedly and immediately fire the shot. The shooter jerks the trigger if he presses the trigger the instant he has a perfect sight alignment. However, this quick reaction or slap usually results in the movement and compression of the rest of the fingers of the dominant hand on the grip and/or the muscles in the hand and wrist to move the muzzle off the target just before the bullet exits the muzzle. Believe me I know all about this problem. Sometimes for me, my anticipation and anxiousness are the genuine culprits for my jerk mistake. I have improved, but must continually discipline my mind to overcome my jerk by mentally concentrating and focusing on the trigger press fundamentals and having a slow, smooth, and deliberate trigger press with minimal movement of my other fingers and hand, while focusing on only the front sight. Sounds easy, but a challenge for me. Flinching is more of a physical response to a shot being fired where the shooter perceives the bang to be unpleasant and possibly dangerous. Flinching is stimulated by the loud noise and movement of a dangerous weapon near the face and head. We know that firing a gun will make a loud noise and there will be recoil. So, it also is a mental issue because we are thinking about and anticipating the recoil and loud noise. Anticipating the upcoming recoil with the loud bang causes our premature reaction to the sound and results in a flinch. With right-handed shooters rounds usually impact high to the right or left. Also, if your shots are hitting all over the target in a wide group, you might be anticipating the recoil and flinching. I actually have had some new shooter students that close their eyes while pressing the trigger and simultaneously shove the gun away from their face and head. Most did not even realize they shoved the gun at the last second before the shot. Of course, this movement often results in moving the gun’s muzzle off target and affects accuracy. Sometimes a flinch is confused with a jerk. The result of a flinch is usually a shot farther from the desired target hit than a trigger jerk, but both do not achieve the desired target hit. I have observed students with a flinch even missing the entire target, as well as having widely-dispersed hits. I must remind myself to physically maintain control of the gun at all times, grip the gun firmly, continue to follow through after my shot, not anticipate the noise and recoil, and be comfortable with the sound of the gun. I have found that putting a lot of rounds down range through practice helps me to overcome my flinch, to accept that I am in control of the gun, and to understand that the movement and noise are not related to my safe shooting practices. I do not fear the gun and noise and so have no reason to flinch. Most recognize the benefits of dry fire practice at home with snap caps or dummy rounds. In addition to cushioning the firing pin and preventing wear and damage to it, they have other advantages, like practicing handling malfunctions and stoppages, loading and unloading, proper grip, and helping your trigger control technique. Here is a very helpful technique using snap caps to identify and overcome flinches and other mistakes. I have found that I can verify trigger mistakes (especially the flinch) by students by loading one of their magazines randomly with snap caps or dummy rounds mixed between regular rounds. So they do not know if the round they will be firing is a real round or a snap cap/dummy. Often a flinch is masked by the recoil of the gun itself, so shooters do not know nor recognize they are flinching. Several students have very emphatically said to me that they are not flinching, but I knew better. By mixing the rounds, it will be very evident to the shooter that they are definitely flinching. When they press the trigger and the dummy round does not fire and they cause movement, they will then have strong, positive feedback that they are indeed anticipating the noise and recoil and are flinching. Milking the trigger is a common trigger control mistake. Milking means that your grip fingers are also contracting as your index trigger finger contracts to press the trigger. Of course, just your trigger finger should move and it should move straight back, smoothly, continuously, without interruption, and non-intermittently (not stop-and-go.) Milking is extra movement that affects accuracy. Fundamentally then, only the trigger finger should move when pressing the trigger. That movement should be straight back, rather than sideways or up or down. The trigger finger should be isolated from the other fingers of your shooting hand and your index trigger finger should be the only finger that moves. Shooters must recognize that when you grab or press something with one hand and fingers, especially while under stress, your opposite hand and fingers may want to unintentionally mirror that movement with a sympathetic response. Studies have shown some inadvertently fire their gun while doing something with their non-gun hand or fingers. Be careful! So shooters must focus on using the trigger finger independently by itself so as to minimize extraneous movement, while maintaining a constant, consistent grip on the gun with the rest of the hand. Practice develops the muscle memory. 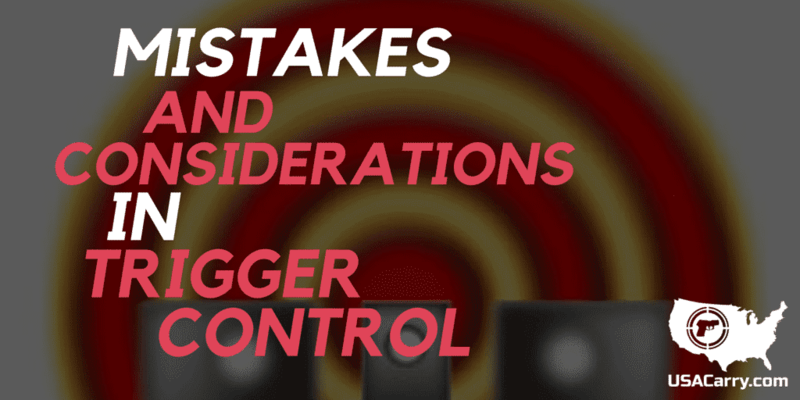 Click here for the last 4 Mistakes and Considerations on Trigger Control. Heeling is when the shooter exerts excessive forward pressure with the heel of the hand as the gun is fired. This pressure forces the front sight up just as the trigger trips the sear. It will usually result in a shot group high near the twelve or one o’clock position on the target. Diagnosing and fixing trigger control Heeling mistakes (as well as any of these mistakes) is not an exact science because several other factors may be involved, like problems with proper grip, sight alignment, sight picture, stable stance, etc. A complete and deliberate focus on the front sight, both mentally and visually, will usually help cure this Heeling problem. Of course, do not anticipate recoil, do not push the heel of the hand forward when the shot breaks, and do not break your wrist upward. Thumbing is squeezing the thumb or applying too much trigger finger/thumb pressure when firing the shot. For example, if a right-handed shooter rotates his thumb clockwise to the right during the trigger press, the rounds will likely hit to the right, a Thumbing mistake. Without a doubt, the point of bullet impact is dependent on the movement of the shooter’s trigger finger, thumb, and hand at the moment the trigger is pressed. Proper grip is a key factor to help prevent the Thumbing mistake. I like to rest my strong thumb firmly on top of my support thumb and try to not move my strong thumb and fingers sympathetically with movement of my trigger finger during the press. Pushing the gun up, down, or to either side with no follow through is a common mistake, especially for new shooters. Placing too little of the finger on the trigger causes the finger to push the trigger back and to the left instead of straight back. So bullets impact the target at 9 or 10 o’clock or miss high. If too little trigger finger is accompanied with a breaking wrist action, either up or down, then bullets impact at 12 o’clock or 6 o’clock respectively. Be certain to firmly lock the strong hand wrist, grip the gun very firmly, do not lean backward, and do not push the gun in any direction at the last second before firing the shot. You should experience a “surprise break” when the shot fires. I strongly believe that a surprise break is absolutely essential to achieving any kind of accuracy with a handgun. For the gun to fire with a surprise break, we apply pressure to the trigger gradually and evenly until it fires… and when it actually does fire, we are surprised because we have not anticipated the exact moment of the break. The key to perfecting the surprise break is a lot of practice where you put steady and incrementally heavier pressure on the trigger until the gun goes bang. Holding Too Long is a mistake that draws out the trigger press because the shooter wants a perfect shot and target hit. I see this in new handgun students frequently because they want to qualify and not have bad shots, so they are very slow, indecisive, and overly cautious in their trigger press. They do not exert positive and proper pressure on the trigger at the proper time. Instead of 3 seconds or so, they may take 7 to 8 seconds for just one shot in basic training. They hold their breath and shot too long. A consequence of a long hold is that the shooter’s breath control is poor and there usually is undesirable movement and less accuracy. The shooter may not have enough air to hold his breath for the long time to minimize movement and this actually causes just the opposite of what they want. They have a miss or an inaccurate shot because of more movement. Naturally, in a real-life encounter or tactical situation, this delay could be deadly. So for your initial training as a new shooter at the range get that shot off in no longer than 3 seconds, if not sooner. But remember, train for accuracy first with proper fundamentals, then train for speed.